President Trump campaigned on a platform of prioritizing the interests of our nation and American citizens when it comes to national security, trade, immigration and jobs. For this American tech worker, it was thrilling to see President Trump, policy advisor Stephen Miller and Disney screwed-by-Iger tech workers at several campaign rallies talking about these issues. Certainly the idea of foreign labor dumping should not be a “foreign” concept to the President, since he’s addressed foreign steel and aluminum dumping. However, American tech workers have yet to see any meaningful reforms on behalf of American citizens by the Trump Administration on the effects of cheap, foreign labor dumping on our job market. Rather, President Trump’s Jan. 11, 2019, tweet on giving H-1B foreign workers a path to U.S. citizenship and the recent increase of H-1B visas for foreign grad students were shocking. The latest H-1B “reforms” announced by the Trump Administration do nothing to protect American citizens from cheap, foreign labor dumping. 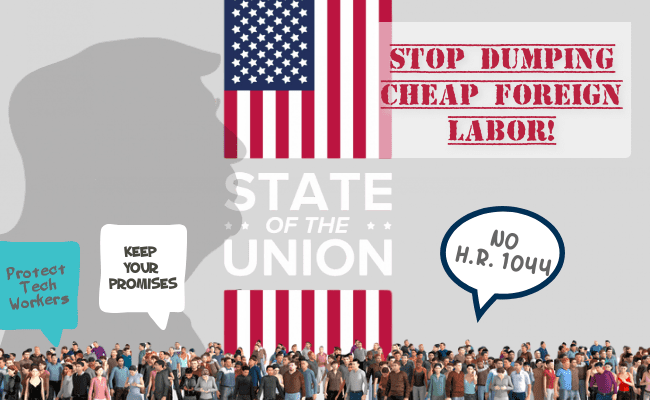 To top it off, President Trump in the State of the Union address said, “I want people to come into our country in the largest numbers ever, but they have to come in legally.” Adding more people to further depress wages for American workers is not in the best interests of the country’s citizens. Let’s briefly look at the latest “reforms” offered by President Trump’s administration. They help corporations more expeditiously hire cheap labor, directly aid cheap, foreign workers, and provide an additional 5,300 H-1B visas to foreign grad students. These “reforms” DO NOTHING for American tech workers. They don’t stop the overall numbers of foreign workers, and they do nothing to address the monopsonistic benefit of the continuing vectors of foreign labor dumping, which drive down wages for everyone. They do not address the impact of these vectors of labor dumping by other additional visa and green card programs, e.g., H-4 (still waiting for that repeal), L, J, O, TN, P, EB-1, EB-2, EB-3, EB-4 and EB-5. And, we can’t forget the laid-off American journalists replaced by the “I” or H-1B visa, although “learning to code” won’t help given all the H-1B visa workers mostly doing simple coding work. How do these “reforms” reduce the overall numbers of close to 2 million new, actual or potential foreign workers allowed legally into our country every year? The so-called reforms make no difference when it comes to protecting American citizens in our own job market. The President needs to listen to American STEM and tech workers, the citizens who actually have done the in-the-trenches work to build the current technology base of our country. The SOTU speech referenced winning WWII and the Cold War and achieving success in space, recognizing legendary fighter pilot and Apollo 11 astronaut Buzz Aldrin, who attended the SOTU address. Americans achieved these feats without cheap foreign labor dumping and H-1Bs. The President invoked the duty of stewardship of our forbears’ accomplishments when he said, “We must choose whether we squander our inheritance — or whether we proudly declare that WE ARE AMERICANS.” My personal and family history of hard work, grit and sacrifice have contributed to America’s victories in war, space and technology in the 20thcentury, and helped create the foundation for our nation’s greatness in the 21stcentury. But we will not continue to achieve this greatness if we continue to displace Americans citizens – whose forbears gave us this foundation – with cheap, foreign, Third-World labor holding third-rate diploma-mill graduate degrees. The “best and brightest” should be good enough to qualify for the O visa or EB-1 GC. If Harvard, Stanford and the other Ivy League-caliber universities can be extremely selective in who they allow in, why shouldn’t our visa programs be just as selective? We must ensure that graduate admissions are not slanted to foreign students just to get the higher out-of-state tuition. President Trump should have a sit-down meeting with American tech and STEM workers, not just tech oligarchs. We can provide the President with actual in-the-trenches assessments of the current labor market and offer real reform ideas that will protect “the lives and jobs of our citizens.” Mr. President we’re waiting to have that meeting.